The dangers of professional football dominated headlines last year when thousands of athletes brought a lawsuit against the National Football League for mishandling concussion claims. Broadcasters with the Public Broadcasting Service (PBS) wondered: How does this issue play out on high school fields? The network sent dozens of student reporters to do some digging, and the results were impressive. The young journalists produced reports on the death of a high school athlete and investigations into the effectiveness of concussion rules. One teen journalist reported on high school football players who were cheating on the school’s mandatory neurological exams to stay in the games, despite possible concussions. The student athletes felt more comfortable opening up about this sensitive topic because the journalists were also their peers. The youth broadcasters who produced these stories attend different schools throughout the country, but each individual is a product of the PBS NewsHour Student Reporting Labs (SRLs). At more than 80 SRL sites throughout the nation, student broadcast journalists receive mentorship from PBS staff in technical production, interviewing, and storytelling. The pieces they produce are published on the SRL website or the NewsHour blog—and exceptional stories like this piece about the player who felt pressure to avoid head injury tests are aired on the national NewsHour broadcast. “It’s one thing to make your own story and have it played on your local station, but to have it noticed by this national organization is really impressive,” said Ruby Rosenberg, a 17-year-old high school senior in Oakland, California. Rosenberg attends Media Enterprise Alliance (MEA), an extracurricular video program open to all Oakland high school students. Participants have the option of working on stories for PBS. The biggest benefit of the relationship with PBS “is the legitimacy and motivation it gives to a student like Ruby,” said Jake Schoneker, program director at MEA. For teenage reporters, audience is typically limited to the handful of people who pick up a school newspaper or tune into a public access channel. SRL reporters are driven by the prospect of their hard work being watched by a million viewers. At a Student Reporting Lab in Oakland, Ca., students can pitch videos to PBS. The veteran reporters who lead the SRL program can’t personally visit each site, but they regularly video chat with the young journalists to guide them through the production process, and they field text messages late into the night. At many sites, the youth are also paired with a staff mentor from a local PBS station. The relationships between PBS and each SRL site vary. Sometimes the SRL is a dedicated class at a school that uses a video reporting curriculum developed by PBS. In other cases, it’s an optional unit in an afterschool program. At one high school in North Dakota, a chemistry teacher with no media experience applied to host an SRL so her students could start telling science stories. PBS provides equipment stipends for programs that need it, but often the staff simply lends additional professional expertise to established youth media programs. The SRL directors demand an extraordinary level of professionalism, which lets the students know they’re taken seriously, said Chris Sloan, an English teacher at Judge Memorial Catholic High School in Salt Lake City, Utah. The young producers are more likely to be interested in current events when they have the opportunity to add—or hear their peers’—perspectives, explained Sloan, whose new media class is an SRL. It’s this platform and power—and undoubtedly the opportunity to get their hands on cool cameras—that attract teens, including those who might not respond to more traditional education models. Rosenberg said many of her peers who are not engaged by the traditional classroom curriculum have become quite passionate about their media projects, something she sees as evidence that more technology is needed in classrooms. Rosenberg’s current project looks at school safety measures in her district. After the school shooting in Newtown, Connecticut, PBS announced that this year’s SRL students should pitch stories on school safety. In addition to an annual theme, the SRL headquarters sends out “Rapid Response” questions on an issue du jour. SRL reporters put together short pieces, which PBS then edits into a story for broadcast. The PBS label lends credibility to student reporters who may typically have trouble securing an interview with, say, a school administrator. But PBS also benefits from the students’ unique access to their peers. SRL is only in its fourth year, but many alumni have scored prestigious journalism internships or are applying to film school. At the very least, most of the participants now watch the news. 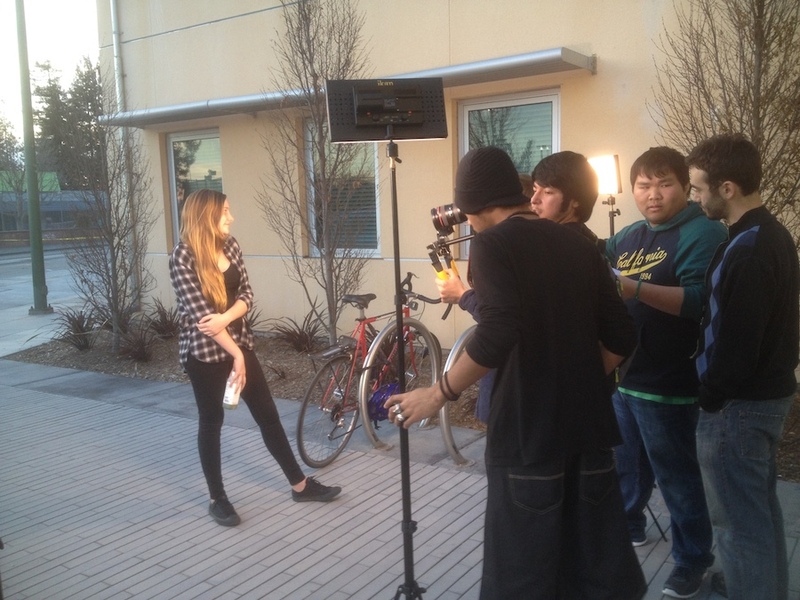 Top Photo: Students at Media Enterprise Alliance, a Student Reporting Lab in Oakland Ca.